Here at Green Car Reports we hear—even attract—a lot of controversy when we report on fuel-cell vehicles. Many our readers argue vociferously that the only green cars run on batteries alone—no, thank you, to range-extending gas engines, either. Others seem to hold out for the hydrogen economy, with cars that can go more than 300 miles on a five-minute fill-up and use purely renewable energy from water—however far off that future might be. So when we came across an old study from the University of California, Irvine, that compares the environmental impact of both technologies, it piqued our interest. Unfortunately, the study is no longer available online, but we were able to capture its two key charts to share. Lots of studies, including this one, show that on a well-to-wheels basis—looking at the energy required and the emissions created to produce the fuel and drive the cars—battery electric cars emit about 50 percent less greenhouse-gas pollution as reflected in their higher MPGe ratings. Still, many skeptics have expressed concern about the extra energy and pollution required to produce and recycle large, heavy batteries for electric cars. Electric cars today are still new enough that the footprint of lithium mining is small, and few electric cars with lithium-ion batteries are old enough yet to feed a large battery recycling enterprise, which could provide better insights on the economic and environmental feasibility of battery recycling. The 2014 UC Irvine study addresses these concerns by looking at the greenhouse-gas emissions of many types of cars, including battery-electric and fuel-cell cars, in two ways. The study examines pollution on a well-to-wheels basis, and on a life-cycle basis—looking from cradle to grave of production of the raw materials to build the car and drive it, then disposing of all of its components. 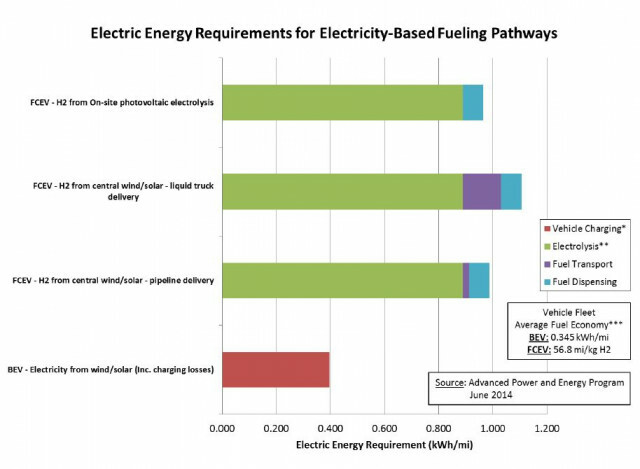 The study affirms that battery-electric cars are more efficient every mile they drive on a well-to-wheels basis. 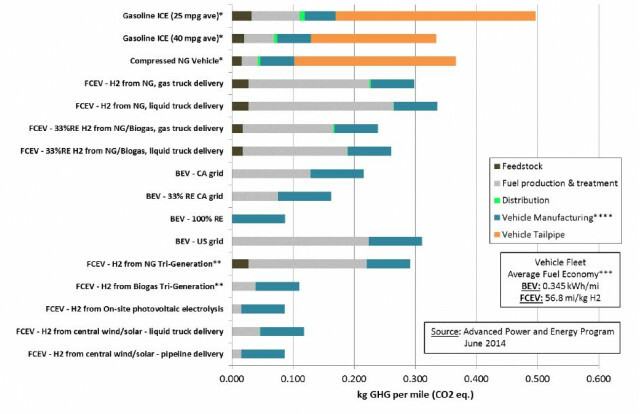 Looking at emissions on a life-cycle basis, however, it gives the advantage to fuel-cell vehicles. The advantage in life-cycle emissions for fuel-cell cars in the study comes down to the need to produce additional batteries to store renewable energy for the grid or in homes to charge cars when they're parked—and when the sun isn't shining and the wind isn't blowing. Of course, many of these batteries are helpful in expanding the use of renewable energy for homes and businesses as well as cars. Whether well-to-wheels or life-cycle analysis is more important, whether one technology is needed to serve as a transition to the other, or whether the two can usefully coexist, are all valid questions. Each technology has its advantages. So far, the infrastructure to produce and distribute renewably produced hydrogen is embryonic at best. 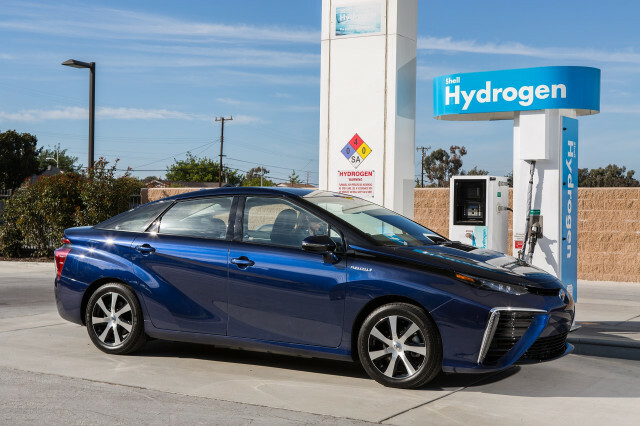 Even some large hydrogen suppliers don't want to get involved in the business of providing transportation fuels. So that clean hydrogen future may still be years or decades in the future, and electric-car supporters may have a valid argument that the world can't wait that long. In the meantime, maybe we can all just agree—to agree. Opinion: Tesla's CEO needs help, but will he take it?